As summer approaches, enrollment managers and admission directors expand their focus to critical issues like professional development, marketing planning, research and pre-enrollment service initiatives. Meanwhile, many colleges are still in the throes of making their 2017 class. According to the recently released NACAC College Openings Update, over 500 colleges and universities are still accepting applications from prospective freshman and/or transfer students for the upcoming fall term. Wherever your institution falls on this wide spectrum of future planning, we have a number of free tools and resources available to you. On our website and YouTube channel you’ll find an ever growing list of admission counselor tutorials aimed at making your counselors even better at their jobs. You can also download the complete reports from our each of our national co-sponsored studies that dive deeply into the hot-button issues that impact your enrollment. Subscribe to our YouTube channel to get even more. There you’ll find tutorials, up-to-date market data, and a wealth of actionable information to help you with your recruiting efforts, today and in the future. 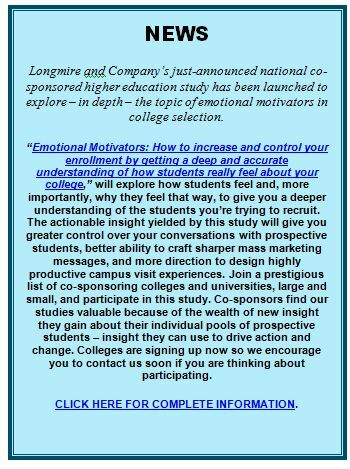 Our most recent video (below) introduces you to the national co-sponsored higher education study we are launching now: Emotional Motivators. This study is based on an old adage: “Facts tell. 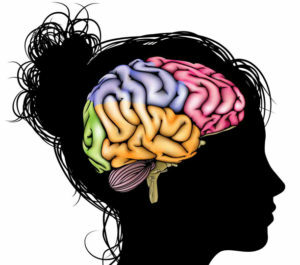 Emotions sell.” Students want and need facts and information about the colleges they consider. But their college selection decision will hinge on how they FEEL about the school they’ll ultimately enroll in. This study will tell you how they feel about you relative to the other colleges they considered (or chose to attend). You should get in as a co-sponsor! There is still time. You can get a deeper level of insight on the pool of prospective students you were/are working for 2017 and get a clear understanding of how you were or weren’t tripping their trigger. Counselor Training Series Overview: Longmire and Company believes that the conversations between prospective students and the colleges they are considering can be much richer and more fruitful for both. Having rich conversations with prospective students provides you with a greater understanding of each student’s unique needs, preferences, motivations, and how they will make their college selection decision. Probing to Uncover Key Information about Prospective Students: The vast majority of counselors don’t cover a sufficient number of topics with a prospective student. We tell you why you must probe and how to do so effectively. Uncover and Break Through Objections and Concerns: We show you how to turn questions, concerns, objections and indifference into conversations that lead to enrollment. Take this Crucial Step Toward More Productive Conversations with Students: Get the student to take the next logical step on the path to enrolling. Learn to Differentiate Your College in a Compelling Way: Break out of this trap: The students and parents you’re talking to are hearing the exact same thing from every other college they are considering. The Counselor Training Series is just the beginning of the valuable free video tools available to you. Again, check out our YouTube channel for more tutorials, powerful data from national co-sponsored studies and interviews with some of your peers. As I mentioned earlier in this post, PLEASE consider getting involved in this new co-sponsored study we’re launching. You’ll benefit from it! Previous co-sponsors get involved year after year because it’s inexpensive and they get insightful and actionable information. Email or call me if you are interested in how we can help. Continue the conversation on Twitter @LongmireCo. For more information about Longmire and Company and the tools we have to offer, click here. Be sure to subscribe to Versions of Conversion today so you can stay up-to-date. Just what are the traits of an exceptional Admission Counselor? Google it and this is what you’ll find: Excellent writing and speaking skills, ability to relate positively to a wide variety of people, enthusiastic, organized, professional in appearance and demeanor, familiarity with technology and data driven systems, able to work both independently and in a team setting, excellent time management skills, and so on. All clearly important attributes for a role that has enormous impact on any college’s recruiting success. But what if prospective students were writing your job description? How would it be different from the stock descriptions you find in a standard job opening announcement? Here are some clues: In a our co-sponsored study, “The Relationship Dynamic,” 38% of college-bound students said that their college admission counselor played a significant role in helping them form a relationship the college they chose. In a separate study, “The Value Proposition,” students were asked to identify and quantify the relative influence of specific interactions on their relationship with the college they selected. Across the board, the students rated social media in the neutral range whereas interaction with admission counselors rated much higher, demonstrating a far greater influence on enrollment. What do students say counselors MUST do? In our recently released study, “Hidden Influences,” over 18,000 prospective students are very clear about what they want from a counselor. Topping the list: Answer their questions. ALL of their questions, completely! While this may be impossible in a practical sense, students have a very high expectation that counselors have an answer for their every question. They expect counselors to be knowledgeable about issues relating to cost, financial aid, history of the institution, outcomes, deadlines, classes required for specific majors and so on. Don’t say, “I don’t know.” Instead say, “I’ll find out.” And do it! If the counselor cannot answer a specific question they expect the counselor to find the answer and get back to them in a timely manner. Students say they develop a strong affinity for a counselor who is well-informed and responsive. It is a key ingredient in their formation of a relationship with the college as a whole and it is influential in college selection. On the opposite end of the spectrum, students voiced their frustrations with counselors who are unable to answer questions and cited examples of counselors who actually avoided questions and requests for information that fall outside the most basic. Many students shared experiences where a counselor had given them information that they later discovered is “wrong” and “inaccurate.” And, students have a very low tolerance for counselors who respond to specific questions with “vague” answers and information. What qualities do top-notch admission counselors have that lead prospective students to enroll? They are knowledgeable and responsive. They know the answers to every question about their school, campus, costs, loans, scholarships, etc… And, if they are asked a question that they don’t have an answer for, they find out fast. They make sure to let the students know that the college is interested in them. They make the student feel wanted. Here’s what admission counselors need to know. You know that a student’s college selection is tied closely to the strength of the relationship they build with a college over time. And, you know that creating relationships is a multifaceted, nuanced and crucial part of student recruitment. But do you know this? Your role is crucial. You are a powerful motivator when you use all of the tools available to you. We help colleges and universities with their recruiting efforts every day. If we can help you, please let me know. If you’ve thought about helping your staff with professional development, now is the ideal time to train and motivate your staff. Email or call me if you are interested in how we can help. Continue the conversation on Twitter @LongmireCo. For more information about Longmire and Company and the tools we have to offer, click here. We will be sharing more key insights from our studies so be sure to subscribe to Versions of Conversion today so you can stay up-to-date.